i love the idea of a piece of art being delivered to my house every month. do you? 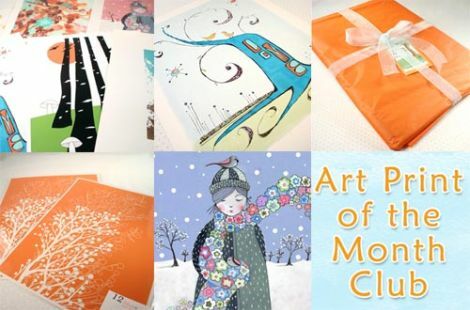 if you do then why not buy the art print of the month series as a gift for an art lover or even for yourself? each month the folks at indiefixx will select one print, festively wrap it and mail it off to you. you never know what you’ll receive ahead of time, which is part of the fun! i say two thumbs up! subscriptions start at $64. purchase them and lots of other fun things right here. exactly. and it is very reasonably priced too! this would make a great gift and will last much longer than a bottle of wine!